The first day I came here, I found the sign of Presbyterian Church in front of the house where I am staying. But my hosting family told me that they have not seen them worship on Sundays. 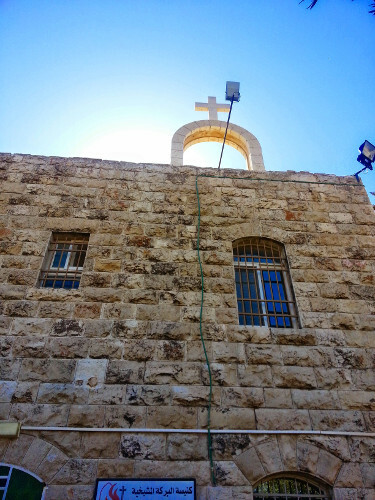 My hosting family told me that they heard of bigger Presbyterian church in Bethlehem, not do not know the exact location. As a favour to me, the father of the family called his neighbour this morning who is in the Beit Sahour Presbyterian Church (the official name is Shepherds’ Field Presbyterian Church), and asked the location. It was on the Hebron street, and he gave me ride there. The church was on the down-side of the road (everywhere here is hill). So the ground floor from my side (west) is underground level 1 from the other side (east). When you go in, you get to the back of the sanctuary. And on the right, there is a door to the common room for after service refreshments. 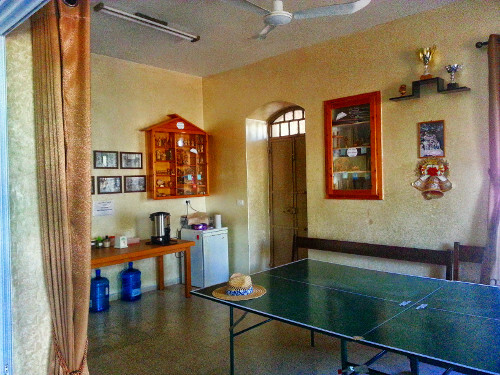 There is a ping-pong table for the youth activities. From the common room, you can enter the tech room where they control the overhead projector and computer, sound mixer and everything. 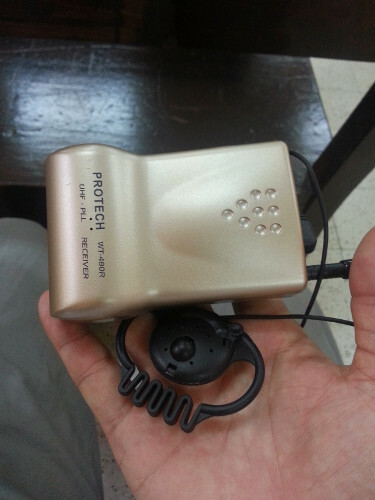 Even they have simultaneous translator equipment. Today, a guy was translating in the tech room only for me. In Bethlehem, it is Christmas year round. The service was much like ours in Canada or America (I mean PCC or PCUSA). And there were about or little more than fifty people including children. There was a Children’s story time, and then they went for Sunday School. Though the service was much like ours, the demographic was quite different. They are mostly young parents, probably around 20s and 30s. 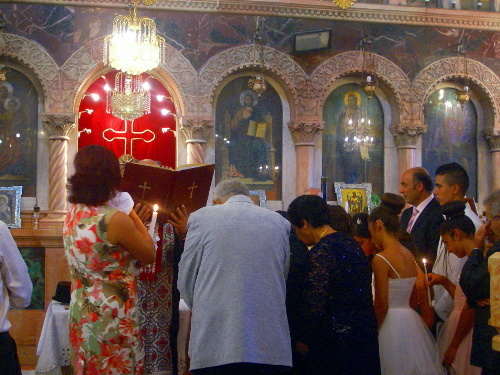 I think that is good sign because even here, the church goers are mostly seniors for Greek Orthodox. 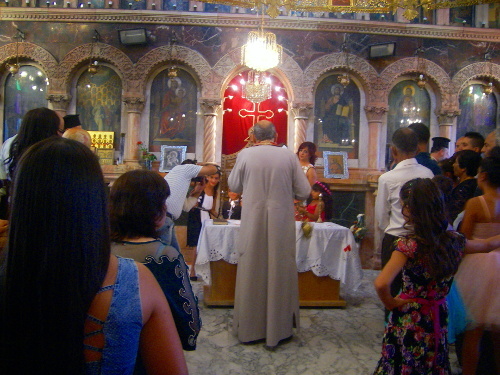 And the service was about hour and half (thank God it is not three hours like Greek Orthodox). 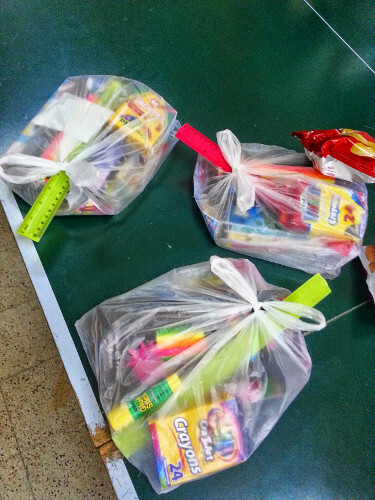 All the children were given a gift package at the Sunday school because the school begins tomorrow. I know the churches in North America usually have yards and some rich Churches (like my church which is Knox Presbyterian Church in Naperville) have even its own playground. That is not true for churches in Korea. I also haven’t seen any playground at Greek Orthodox Churches. But this Presbyterian church has its own small playground. I love it! 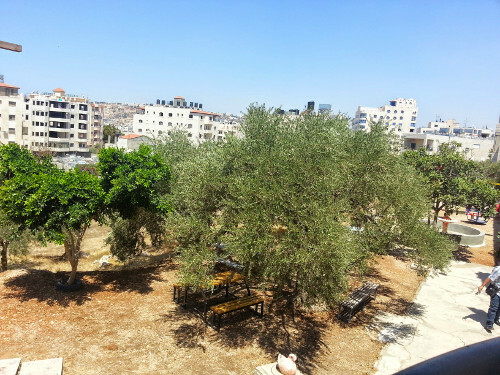 And it is kind of law in Palestine and Israel that where there is yard, there are olive trees. 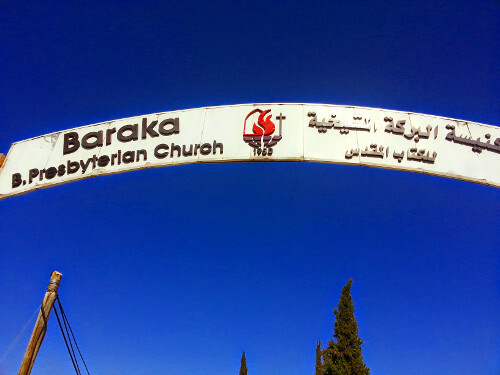 I found that the Presbyterian church in Beit Sahour comes here to join the Sunday service because they do not have a lot of people, and it is the daughter church of Baraka Bethlehem Presbyterian Church. 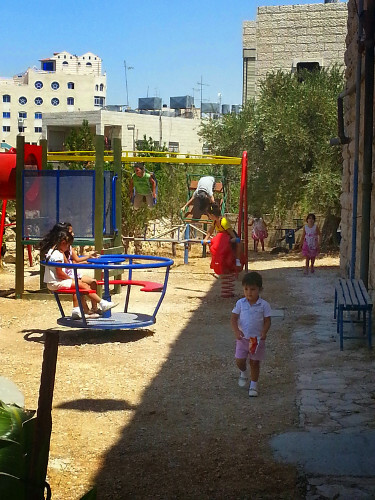 They also have a day-care and education centre in Beit Sahour. So instead of walking back hour and twenty minutes, I got a ride back home. 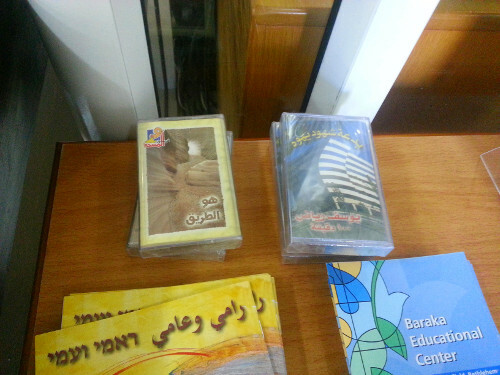 And thank God that the Beit Sahour Presbyterian church is literally right next door! They sell some souvenirs in the church along with some Christian music. Some of them are in cassette tape. I cannot really remember when was the last time that I listened to the cassette tape. And I don’t have a cassette tape player, so I could not buy this one even though it was cheaper. But does not the sales mean people actually listens to it? 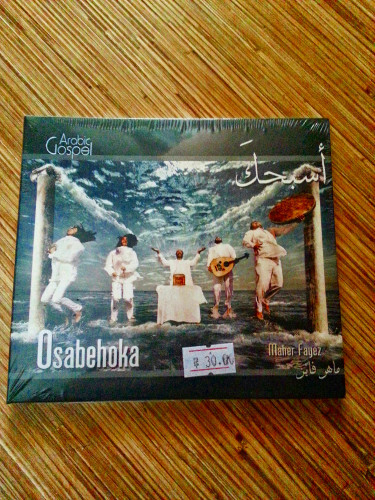 Instead of the cassette tape, I bought a gospel music CD in Arabic. I can borrow this CD if you are my neighbour and you want it. The church was selling it for 30 shekels. And I found later that it is cheaper if you buy it at Amazon. But that is OK, it is just 5 shekels (which is about $2), and I may think I helped the church. It is not related to today’s topic, but: the father of this hosting family installed an alarm app from the Israeli government that warns the location and sounds the siren when the missile launch was detected from Gaza so that people can run to the shelter. And it sounds the siren twice every minute, literally. But the location is mostly southern Israel, so we don’t have to run. Well, actually we don’t have a shelter to run in Beit Sahour or any Palestinian area in West Bank. After class, my hosting family asked me if I was interested in watching baptism. Of course I was. So I went to their church with the hosting family. This is the 300 years old building. 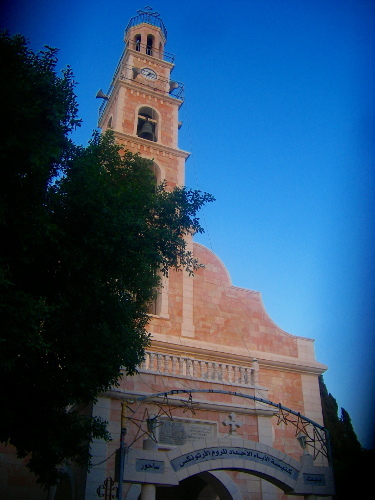 They said that they built this church upon their old church, and still they use the older church now. There are a couple of doors leading to downstairs or underground. This is the baptismal tub for babies. Baptism is processed by at least two priests. 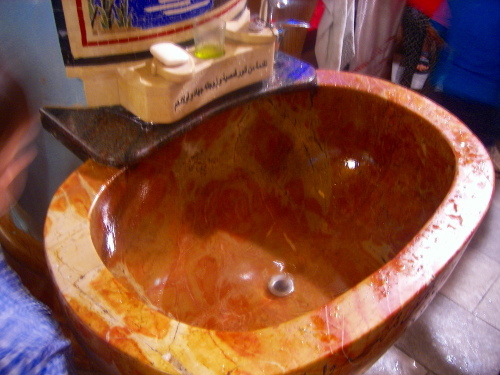 One priest fill the tub with water and bless the water with prayers and continuously cutting the water in cross shape with his hand. The other priest is next to him with the parents of the baby. He blesses the baby with prayers and the Bible, and the put the olive oil on the baby in cross shape. Now the baby is dressed in normal baby suit. The other priest pours out the olive oil in the tub. And the parents prepare the baby naked and also the priest put on a towel around his waist. Before he puts the baby in the water, he lifts the baby high so that everybody can see it. Then he puts the baby completely into the water three times. And everybody in the church shouts for joy and makes loud happy noise. And the priest put some special mixed oil onto the baby in cross shape. Now, of course the baby is naked. Then the priests go up to the pupil, and the baby is dressed in white (wedding) dress no matter the baby is boy or girl. And the whole family processes to the front. 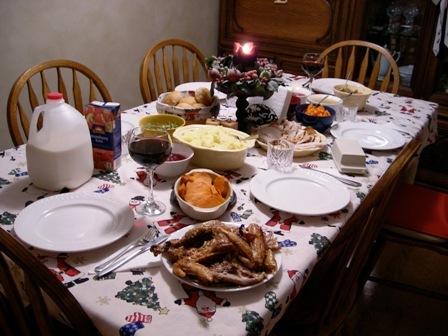 Then the baby’s family stands one side of the table, and the priests opposite side. They go around the table and blesses the baby. One of the priests shakes the incense case continually. They do it for a while. Then another priest come with the open Bible, and touches the baby’s head. 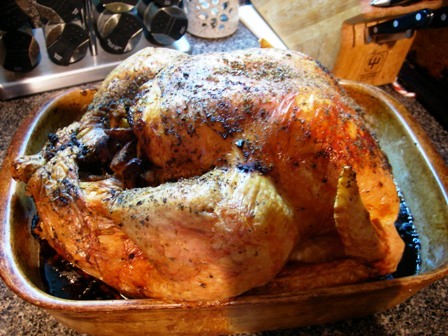 At this time, the whole family must bow down their heads. And through all the ceremony, the people in the pew remain standing if possible. And the baby gets the very first communion. Then the family recess to the outside, and they stand in a row. Then the whole crowd follow them and greet them with happy congratulation. 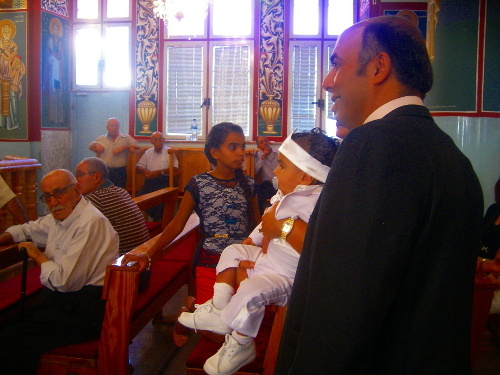 The baby baptism is not part of the Sunday service, but separate ceremony, and it is much like wedding. 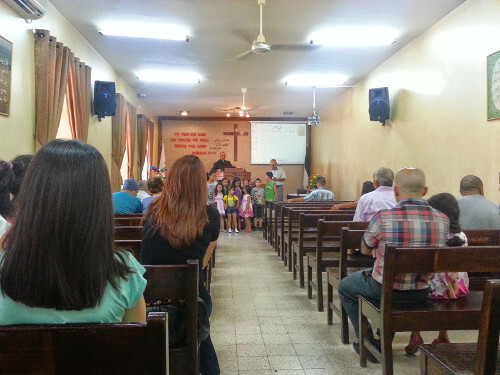 There were about 80 people in the church, so I asked my hosting family if they are the congregation of this church. 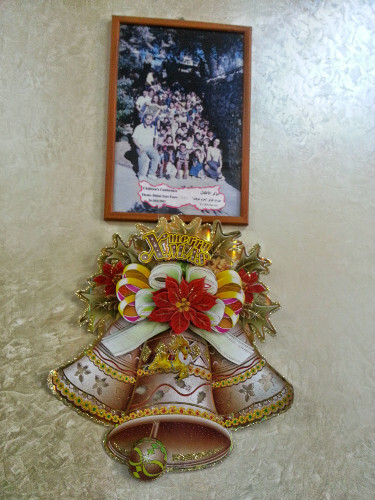 And I was told that this is family event, so only the close relatives/kins came. 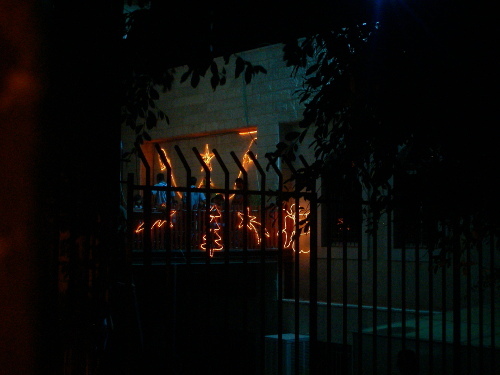 In Bethlehem and Beit Sahour, we have Christmas year round. I had dried figs in Canada couple of times, but I’ve never had fresh figs before. Fig is kind of unique fruit. For apple, we do not eat the core part where there are seeds. For orange, we do not eat the peel. But for the fig, we eat everything, literally everything. And it is very sweet. If you eat two, you may feel happy. I understand why Jesus was looking for fig tree when He was hungry. 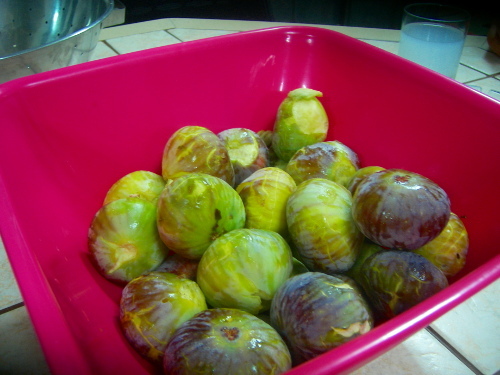 And this is home-grown figs. Jesus gave us gifts by His birth and so far I found two. One is salvation and the other is a day off. 예수님께서 당신의 탄생으로 인류에 선물을 주셨는데, 나는 여지껏 두 가지를 발견했다. 하나는 구원이고, 나머지는 하루 휴일. Recently I saw the news saying about the Vancouver, Toronto and other parts of Canada having extremely much snow. Vancouver got much more snow than Winnipeg! What a surprise! When I was visiting Brenda’s, they got a phone call from Bill’s son living in some town in Ontario. They said they got a snow up to their chest at once and still snowing. It was last Sunday. And we had cold weather last week, but on Christmas eve, Christmas day, and Boxing day (which is the next day of Christmas), God gave us spring-like warm weather. 최근에 뉴스를 보면 밴쿠버, 토론토를 비롯한 다른 캐나다 지방에서 얼마나 극단적으로 눈이 많이 내렸는지 나온다. 세상이 밴쿠버가 위니펙보다 훠얼씬 눈이 많이 내렸다니, 참 놀랍다. 브렌다집에 놀러 갔을 때, 온타리오에 사는 빌의 아들에게서 전화가 왔는데, 단 한번에 눈이 가슴 부근까지 내렸단다. 그거 바로 지난 주일 얘기다. 그리고 지난 주에 날씨가 추웠는데, 성탄전야, 성탄절, 그리고 복싱데이(성탄절 다음날)에는 마치 봄날과 같은 날씨였다. I heard so many times that they could not feel it Christmas at all in Korea.So, I post the Christmas light in Winnipeg. Hey, feel it! It’s Christmas! 한국에선 성탄절 분위기를 전혀 못 느낀다는 얘길 많이 들었다. 그래서 위니펙의 성탄절 불빛을 올린다. 성탄절을 느껴보라! * Warning: the video clips were taken by a Digital Camera at night so its quality is very poor. *경고: 동영상은 디카로 밤에 촬영되어 품질이 기가막히게 나쁨. A house in Addison St. near my home. 집 근처 애디슨 거리에 있는 집. Look at the video clip of this house. 이 집의 비디오도 보길. Now, we moved to South part of Winnipeg along the Kenaston Blvd. 케너스턴길을 따라 위니펙 남부로 갔다. This is the video clip of Candy Cane Lane – whose name exists only in Winter time. 이 건 지팡이 사탕 길이라는 곳 동영상인데, 이 이름은 겨울에만 존재한다. And this is the Lindenwood area next to Candy Cane Lane. 그리고 이 건 지팡이 사탕 길 옆의 린덴우드 지역. Actually we went to Taylor’s house by the Roblin Blvd and it is personal, private decoration of Christmas light. This is the video of the entrance of the yard. 사실 로블린 거리에 있는 테일러 집에 먼저 갔는데, 개인적으로 성탄절 장식을 한 곳이라고 한다. 먼저 입구 동영상. He has a small train track in his yard and the train runs on it! I saw the train full of kids. 마당에 조그만 기차길도 있고 기차가 실제로 달린다. 기차에 아이들이 가득탄 걸 봤다. Here is another video clip of this house. 여기 이 집의 다른 비디오 클립도 있다. Now, this is the Dickens Cres. which is very close to my home. 그리고 여긴 우리 집에서 무지 가까운 디킨스 거리. And a house in Westwood Dr. 그리고 웨스트우드 거리에 있는 집. For the finale, this is the Winter Wonderland by Canad Inn at Red River Exhibition. Of course we need to pay to get there. 마지막으로 캐넛 인이라는 호텔에서 마련한 윈터 원더랜드라는 곳인데, 레드 리버 전시장에 있고, 여기 가려면 입장권을 사야 한다. I also took the video of this Winter Wonderland and tried to upload to Youtube but it said that clip was too long. I am going to try chop it and if I success, I wll post another post for it. Anyone tell me how to edit videos on Linux. My linux is Ubuntu using Gnome. 이 윈터 원더랜드 동영상도 찍었는데, 유튜브에 올리려 했더니 너무 길다고 나온다. 편집을 좀 하려고 하는데, 만일 성공하면 이 비디오로 별도로 글을 쓰겠다. 누가 리눅스에서 동영상 편집하는 법좀 알려 줘. -_-Gnome을 쓰는 우분투임. Now, feel it again! It’s Christmas! 이제 다시 성탄절을 느껴보길! I heard it from Bill who is Dutch Canadian. Because he came to Canada when he was 14 years old, he knows much about Dutch things too. In Canada, we have Santa Claus or Father Christmas who give the Christmas gifts to the kids, but in Holland, they have St, Nicholas instead who gives the gifts on December 5 – not Christmas or Christmas eve. 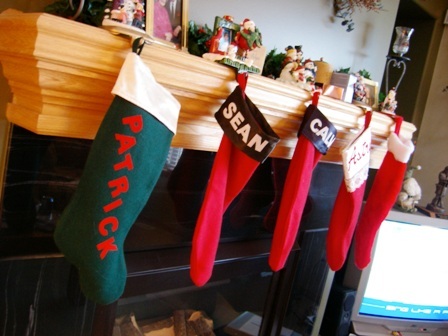 St. Nicholas has nothing to do with Christmas. And there are also one more named Black Peter from Spain. While the St. Nicholas gives the gifts to the good kids, Black Peter give to the bad kids – he brings a bag of coal and gives a coal to the bad kids. And I was told that the Black Peter is quite scary to the kids because he give coal, not the gift. 빌이라는 분에게서 들은 얘긴데, 네덜란드에서 온 분으로 14살때 캐나다에 왔기 때문에 네덜란드에 관한 것도 꽤 많이 알고 있는 분이다. 캐나다 또는 한국에선 산타 할아버지가 성탄절 선물을 아이들에게 주는데, 네덜란드에서는 성 니콜라스가 대신에 선물을 주는데 성탄절이나 성탄전야에 주는 게 아니라 12월 5일 준다고 한다. 성탄절과는 별로 상관이 없는 사람이라고 한다. 그리고 블랙 피터라는 사람이 또 등장하는데, 스페인에서 왔다고 전해진다. 성 니콜라스는 착한 아이들에게 선물을 주는 반면에 블랙 피터는 나쁜 아이들에게 준다. 석탄 부대를 갖고 다니면서 나쁜 아이들에게 석탄을 준다고 한다. 그리고 아이들은 이 블랙 피터를 꽤 무서워 한다고 하는데, 선물이 아니라 석탄을 주기 때문이라고 한다. I was invited by Isenor this Christmas. I think Mr. Craig is soldier now and he is Canadian from Nova Scotia, and his wife, Mrs. Astrid, is from Germany. And they have three sons. 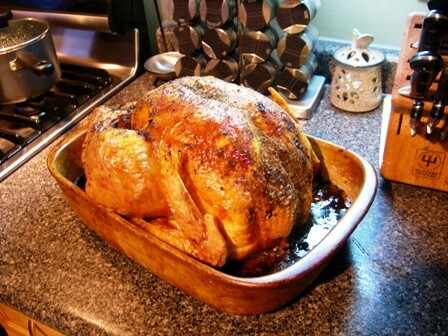 She cooked a baby turkey which was huge to my eyes four hours and twenty minutes in the oven. I played Wii with their kids and watched the Simsons Movie DVD, installed Karaoke and sang with them. Well, it was really really very merry Christmas to me. And it was very good to see the happy family. The parents are kind to their kids, and the kids are very polite and nice to their parents. Of course, there are many kids rude to their parents in Canada, but not Isenors. They are so polite and nice.